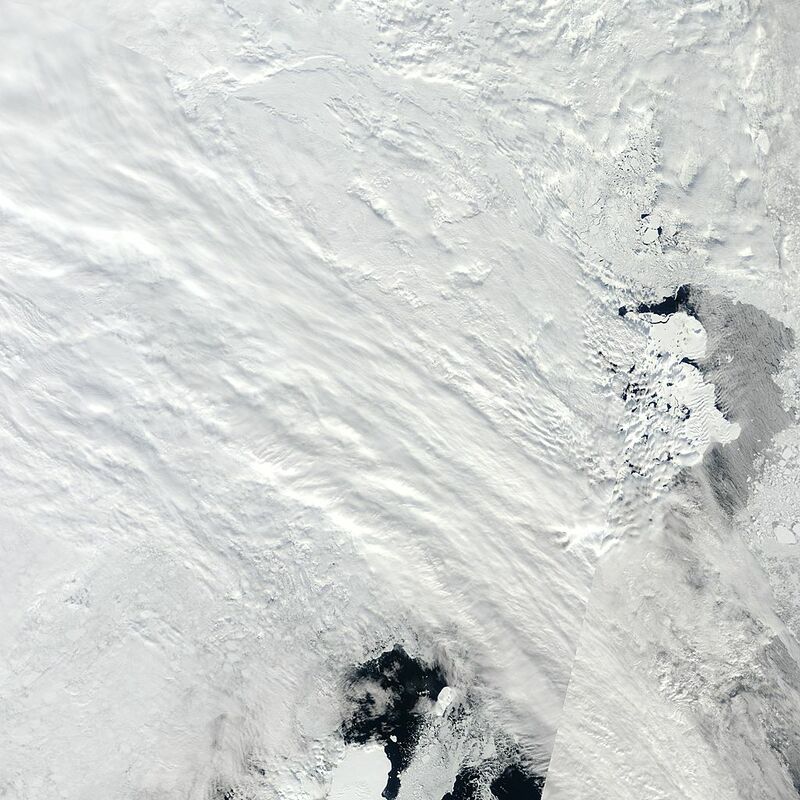 Persistent Arctic Cyclone and The ‘Warm Storm’ of 2013: How Unusual is It? Is Central Ice-Thinning Normal? What are the Worst-Case Scenarios? I posted a short response to their comments here and here. But I wanted to take the time to explore their questions in greater depth. Hence, this blog post. First, let’s take a look at the current PAC 2013, its forecast duration, and how it compares to other storms. For context, it is important to note that most cyclones in the Arctic basin last for 40 hours or less. 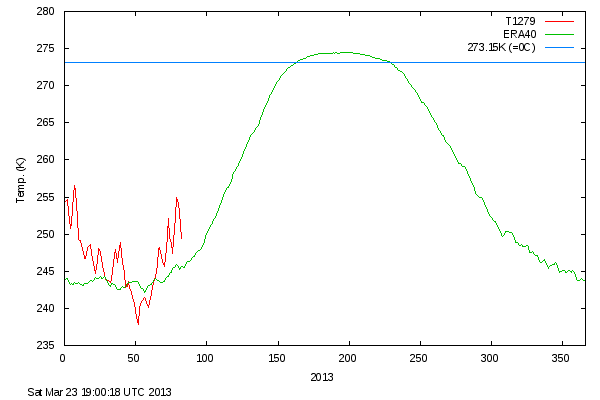 By comparison, PAC 2013 began on about May 26th and has remained in the Arctic for about 16 days. Forecasts now show the storm persisting until at least June 21rst. If the storm lasts this long, it will have remained in the Arctic for 26 days. Another comparison can be seen in the Great Arctic Cyclone of 2012 (GAC). This storm was the 13th most powerful storm ever to impact the Arctic in the modern record. It lasted for about two weeks and reached a minimum central pressure of about 966 mb. The current PAC 2013, while lasting longer (and projected to last much longer) than GAC 2012, reached a lowest central pressure of around 975 mb while averaging in a range of 985 – 995 mb. It is worth noting that Arctic cyclones are a year-round phenomena. And that more numerous, though somewhat weaker storms, have been noted to appear from May to July. That said, the strongest, longest duration storms usually occur during winter and can last for three weeks to a month or more. During summer, Arctic cyclones are weaker, pack less of a punch, and usually don’t last as long as winter storms. What makes PAC 2013 and GAC 2012 exceptional is the fact that they were both strong, long duration storms occurring during summertime and that they occurred under conditions of record thin Arctic sea ice. There is some research to show that the strength of summer Arctic cyclones has been increasing since the late 1970s. These researchers show that increasing levels of moisture and higher temperatures around the Arctic during summer time have added fuel to the formation of new storms. Weather records do show the strength of the most powerful summer storms generally increasing with time. Overall, PAC 2013, though somewhat weaker than GAC 2012 at peak strength, is projected to remain in the Arctic for a very long time. And with lowest pressures rivaling that of a moderate-strength tropical cyclone, it should continue to have substantial impacts — both to Arctic weather and to sea ice. The Great Arctic Cyclone of 2012 was also unique because it was the first storm to have a major impact on Arctic sea ice. Though researchers have tended to disagree over how pivotal the storm was in reducing ice to the record low values achieved during 2012, it is generally accepted that the storm melted at least 250,000 square kilometers of sea ice during early August. 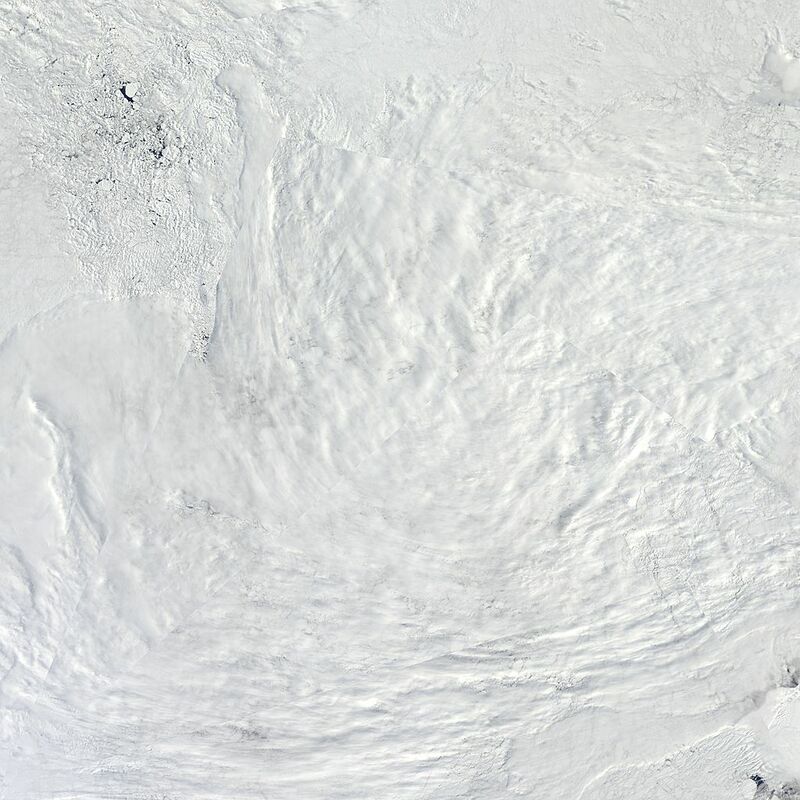 The storm achieved this feat by mixing the surface ice with warmer waters lying just beneath. Wave action and cyclonic pumping of warmer waters from the depths provided a powerful force for thinning and melting the surface ice. Though no direct research on sea ice volume losses due to GAC 2012 has been published, CICE images before and after the event speak to a major thinning as a result of the 2012 Cyclone. Note the large areas of ice thinned into naught by the storm as it plowed through the East Siberian, Chukchi, and Beaufort Seas. A region of central ice was also noticeably thinned during the storm. We can, therefore, say with some confidence that it is the ice thinning forces of the storm which caused the loss of 250,000 square kilometers of sea ice attributed to its impacts. But we can also say that a visible and, as yet, undetermined volume of ice was also lost and that this loss substantially contributed to 2012’s record low status. A similar situation is now present during PAC 2013. 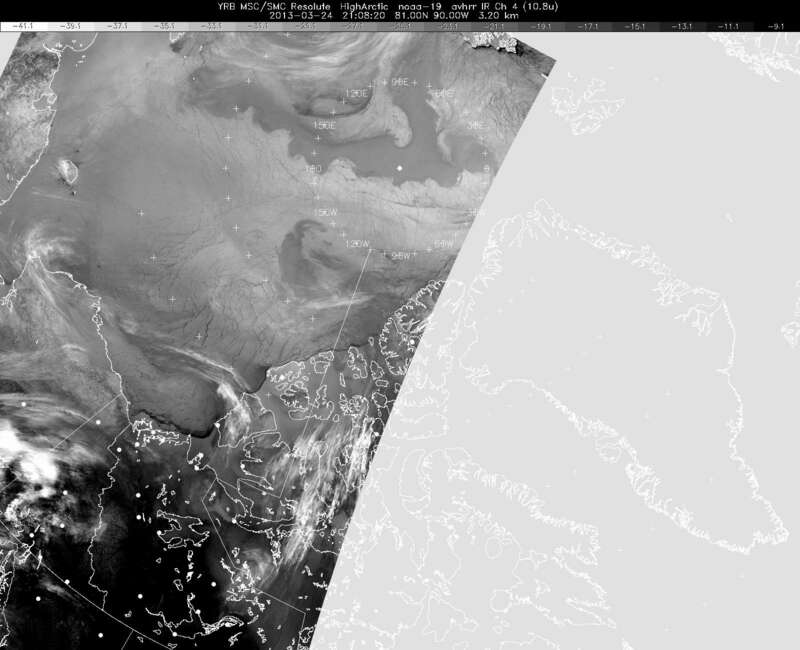 Substantial thinning is now visible in all the sea ice monitors, especially on the Russian side of the North Pole. But this event is different from GAC 2012 in that is occurring during June, a period of time in which the ice is thicker and more resilient. A period of time when air and water temperatures are relatively cooler. 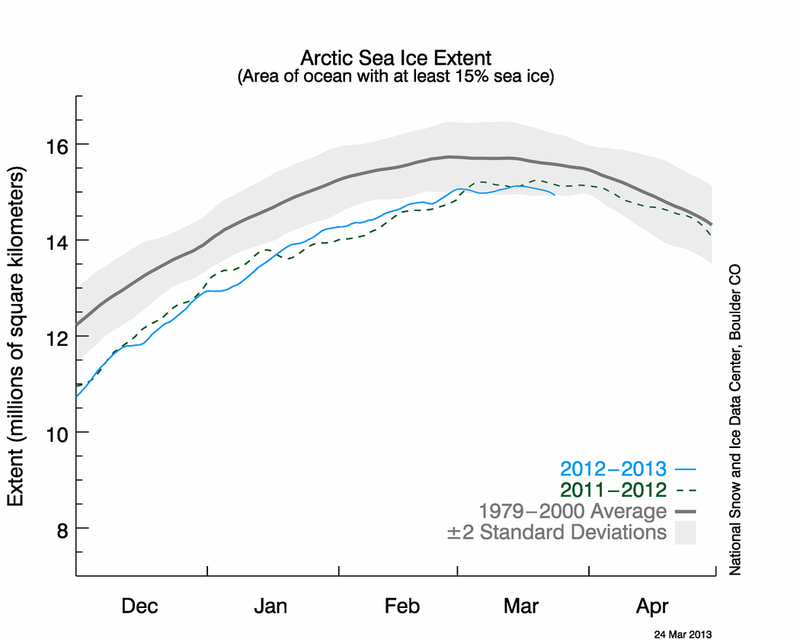 As a result, no where near as much in the way of sea ice area losses can yet be attributed to PAC 2013. I say ‘yet’ because this storm appears determined to stick around for the long haul. So we may see major area losses arise as a result of its action. In any case, it is worth looking at before and after thickness maps to determine the level of damage caused by PAC 2013. 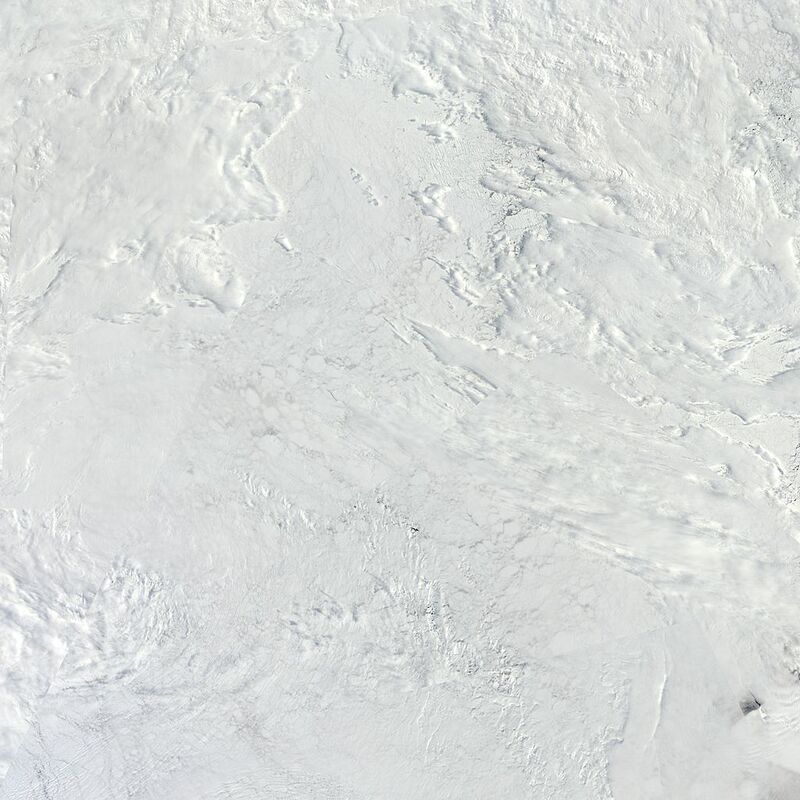 As is plainly visible from the above set of images, PAC 2013 has dramatically hollowed out the central sea ice. With at least another ten days of duration expected, we are still just in the preliminary phase of impacts. These should ramp higher as the days continue to progress. (Note, the last image was added on June 18th, two days prior to a possible cessation of the storm). Both PAC 2013 and GAC 2012 are new events for the reason that they result in melt and weakening of sea ice. This is unprecedented because past storms did not generate measurable losses in summer (You can look at some of this research here and here). To the contrary, it was thought that the cloudier, cooler storms were generally protective. And this was true in a cooler climate. Now, strong storms have a potential to result in losses. And this new feature is an environmental condition brought about by human-caused climate change. Is This the First Time We’re Witnessing A Summer Cyclone Thin the Central Ice in June? Now that we have a little background on summer cyclones and how climate change has enabled them to both significantly thin and melt ice, we can confidently answer the question: is this the first time we’re witnessing a summer cyclone thin the central ice in June? 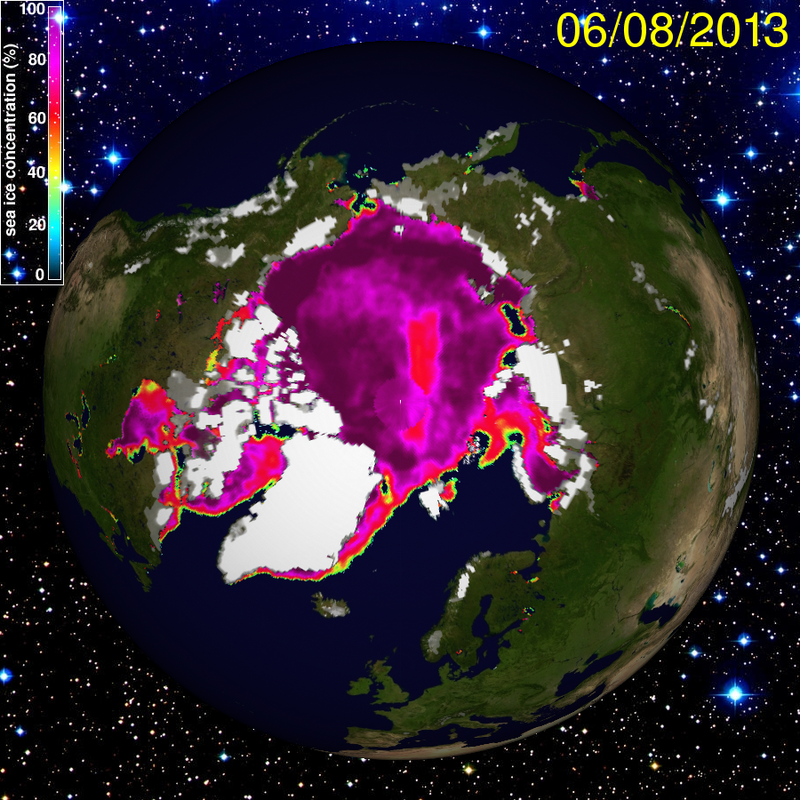 In the satellite record, there is no precedent for a June storm melting and weakening the ice in the past. Though June storms have impacted and fragmented the ice before PAC 2013, this storm is the first powerful, long-duration event to have such a large, measurable melt effect in early summer. As noted above, past storms were thought to be defensive, resulting in a more resilient ice pack and less melt, overall, come end of summer. In part, such widespread damage is due to the fact that the area currently influenced by the storm is so large — covering all of the Central Arctic. The other reason is the fact that the ice in this key region is supposed to be the most resilient to late summer losses. Instead, in early summer, we see damage and erosion. Were the storm to end now, it would leave the central ice thinner and weaker to the assaults of late summer. But the storm hasn’t ended. It continues to churn and thin the ice even as temperatures rise. It is possible that, if this storm lasts long enough, remains strong enough, and pulls in enough warm air, it could produce a large region of open water at the very center of the ice pack even as it shoves a large portion of the thickest ice toward the Fram Strait. Such an event would not only be unprecedented. It could be catastrophic. So now we’ll address the nightmare scenario for this particular event. This expose is by no way a prediction. It is just an illustration of what the worst case, in this event, could look like. It is also, by no means, the only way we could lose all or most of the central ice. The ice, for example, could melt out under a sustained assault from the sun. The central ice could take a hit from a swift, powerful storm, then melt as warm air and sunlight moves in behind it. We won’t examine these and other cases. Instead, we’ll take a look at the worst case in the event of a long-lasting Persistent Arctic Cyclone that warms and churns throughout a good portion of summer. The Persistent Arctic Cyclone that emerged in late May continues on through June and into July. As the Arctic warms, more above freezing temperatures get wrapped into the storm. Eventually, much of the region it covers warms to a range of 0-6 degrees Celsius. Rain becomes a primary form of precipitation in the storm. The added moisture, warmer cloud cover, and above freezing precipitation create a constant surface stress to the ice. Underneath, the constant churning pushes water temperatures above freezing due to an ongoing mixing of the cold surface layer with deeper, warmer waters. The combined result is an ice melting and thinning machine. By the end of June, a growing region of open water (concentration 20% and less) has emerged. The open water is a breeding ground for powerful waves and a magnet for sunlight streaming down through periodic breaks in the clouds. This region of warmer water thrashes and bores through the ice as July advances, creating a pheonomena never before seen in the Arctic — a large, central region of open water surrounded by thinning ice. The result is ice edge melt occurring at the same time as central ice melt. From the cored out portion, an arm of open and or nearly open water begins to sweep around the Arctic, clearing away ice in its path. The arm extends to weakest areas of sea ice. A most likely candidate for this arm’s development is the Laptev Sea as there ice there has been weakest since start of melt. These three factors would be devastating enough. But a fourth factor provides the coupe de grace: Fram Strait export. 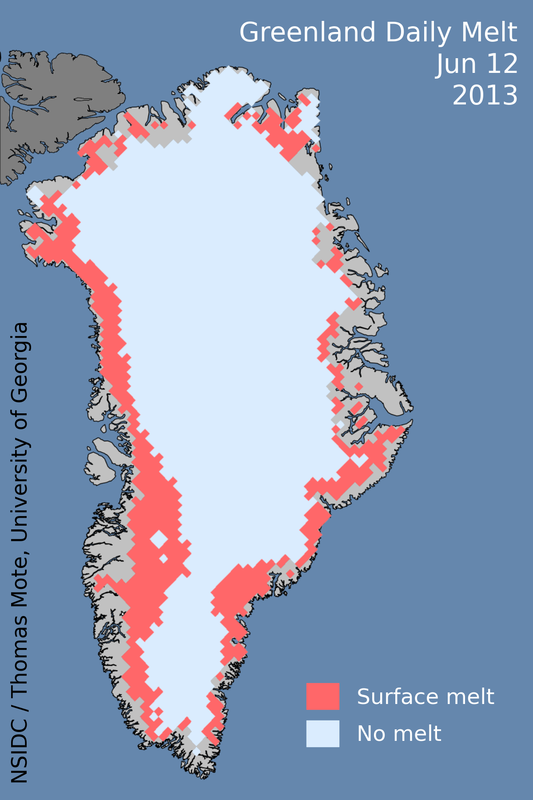 The constant counter-clockwise motion of our warm storm has been shoving at the remaining thick ice anchored on Greenland and the Canadian Arctic Archipelago since early June. 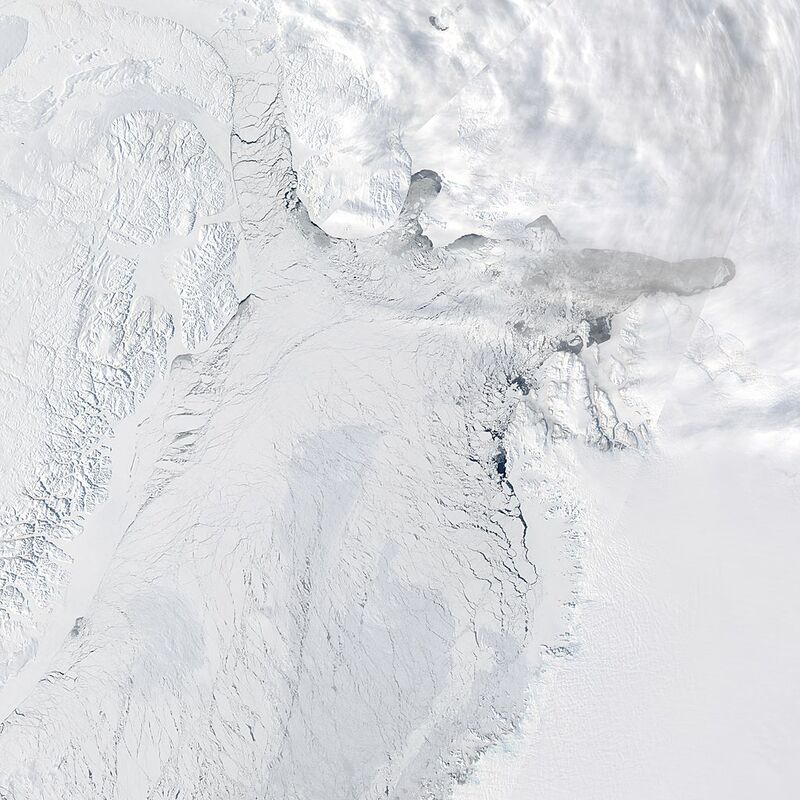 Increasingly, large volumes of thick ice are flushed out the Fram Strait. By end of June, as much as 10% of the thick ice has been exported. But this is just the beginning. During late June and early-to-mid July, warm air invasions from the south have melted and thinned the Canadian Arctic Archipelago ice. Now thinning and fractures from this warming have advanced into the thick ice, weakening its anchor. During July, there is less resistance to the storm’s counter-clockwise motion so more and more thick ice ends up meeting its end through the Fram Straight. By early August, the storm has lasted for an excessive period — nearly seventy days. But it still churns on, fed by an endless procession of storms and injections of warm, moist air from the south. In a final explosion of weather never before seen in the Arctic, much of the remaining thick ice is ejected, melted, or churned beneath a storm-tossed Arctic Ocean. By early September, the storm finally disperses, but little or no ice remains. The above ‘Warm Storm’ scenario is pure speculation. We have no reason to believe the current PAC 2013 will last so long or will have such powerful effects. More likely, a still damaging but more moderate erosion of central sea ice combined with an enhanced Fram Straight export will occur. Should the storm last until the end of June, these damaging impacts will be more than enough to weaken the ice. That said, should the storm last longer, then we will have an altogether unwelcome opportunity to test this ‘Warm Storm’ theory. 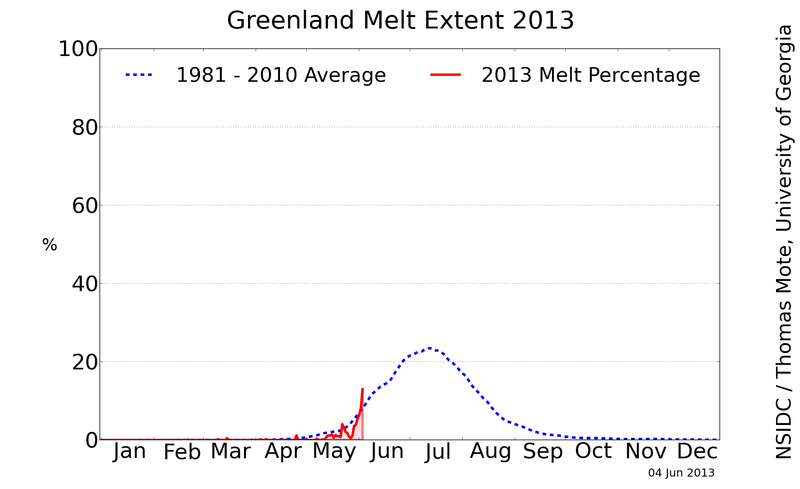 How critical to melting is PAC 2013? And the answer to this question will depend on the duration of the storm, its relative strength over time, how much warm air is injected into it over the course of its life-span, and how much warm water it is able to dredge up from beneath it. At the very least it has already played a major part in early season melt. Should it last for a long duration, the story of 2013 melt may well become wrapped up into that of this particularly anomalous storm. 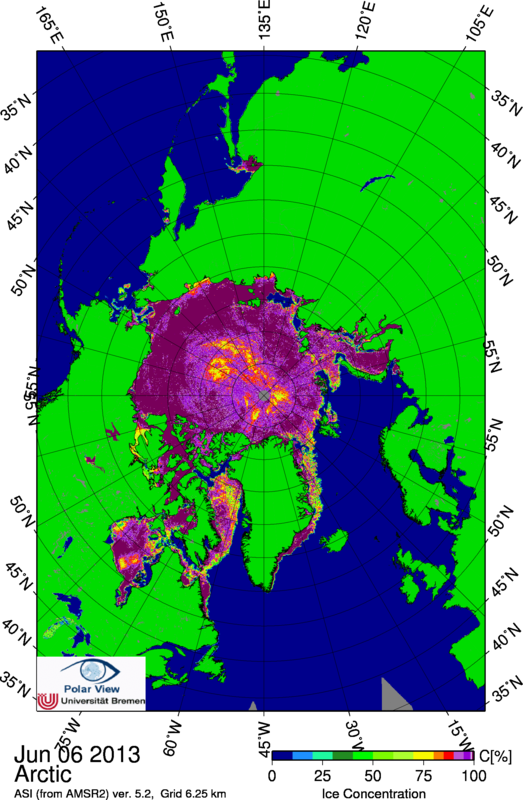 According to Cryosphere Today, Saturday’s Arctic sea ice area measured 10.22 million square kilometers. By Monday, that number had dramatically fallen to 9.81 million square kilometers. This loss of 410,000 square kilometers over the course of two days is extraordinarily rapid, even for a time of year when melt has tended to accelerate. On sea ice area graphs, it makes the last few days look like area numbers fell off the edge of a cliff. (Note that Cryosphere Today area numbers usually lag by a few days. So what we’re actually seeing is area measurements through Friday, June 7th). Up until recently, sea ice area melt had been relatively moderate. But now, after a week of consistent 100,000+ square kilometer daily losses, and two days of 200,000+ losses, sea ice area is only a smidge above that of record melt year 2012 on the same day in June. In total, more than 800,000 square kilometers were lost over the course of the past week. This melt rate, if sustained, would render the Arctic ice-free by late August. If we look at past records, it is not likely that these rates of loss will continue. But past records may not prove a good guide in the current age of fragile Arctic ice. It is quite possible, given the ice’s fractured, frail, and mobile state, that such enormous melt rates, in the worst case, could be sustained or even exceeded. In this event, we would witness a total collapse of Arctic sea ice by the end of this year. So should current dramatic melt rates be sustained or worsen, we may be upping our forecast chances for near total melt by end 2013 (still at 10%). In any case, warnings that we were not out of the woods after a slower than expected melt during May, seem to have born out in spades. The twin forces driving this sea ice loss are the Persistent Arctic Cyclone of 2013 (PAC 2013 — I’ve decided to keep this name. Neven has sanctioned it, even as he playfully recommended calling it Rocky Balboa, which would be entirely appropriate for this dogged storm. ), which we began warning about on May 30th in The Big Thin Begins, and a rapid edge melt that also began in early June. 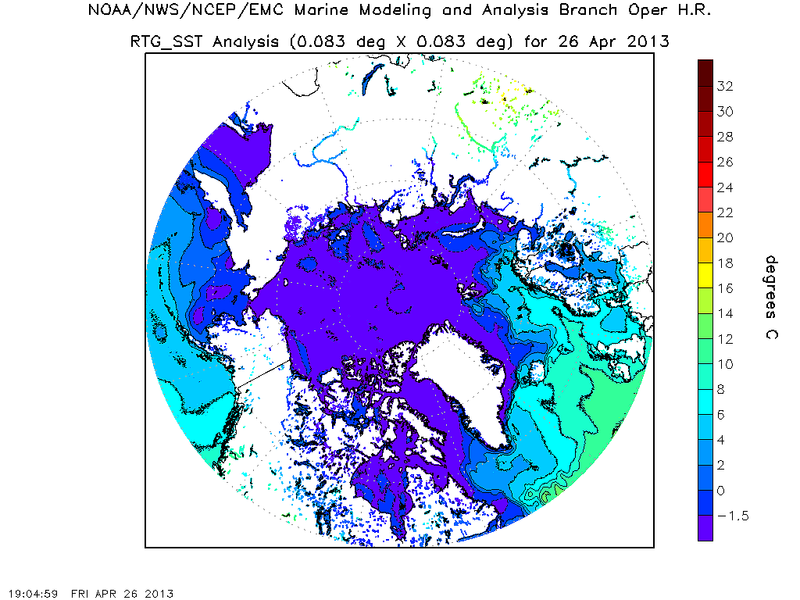 PAC 2013 has, for more than two weeks, been invoking a number of forces detrimental to sea ice in the Central Arctic. It has pulled warmer water up in a column beneath it, melting the bottom ice. It has, through cyclonic action, dispersed the ice away from its center of circulation. And, via energetic storm winds, it has churned and disturbed the surface waters just beneath the ice or at the surface, creating a mixing action that also erodes the ice. Note the major thinning in a region of the thickest ice even as thinner regions closer to Siberia ablated further over the past ten days. Note the large swatch of red running directly through the Central Arctic. That’s a broad region of ice thinned by our Persistent Arctic Cyclone showing up in the Cryosphere Today measure. Today, the cyclone has shifted toward the Laptev Sea and is dramatically churning the thinner ice there, shifting its special brand of havoc closer to the Siberian coastline. We’ll discuss more about this new development in an upcoming PAC 2013 forecast. As PAC 2013 churned through the Central Arctic, melt accelerated at the ice periphery. In the Canadian Archipelago, large regions of ice turned a characteristic shade of blue as melt lakes developed and insolation began to do its work there. Both Hudson Bay and Baffin Bay also saw dramatically increased rates of melt. This larger region of the Canadian Arctic saw a powerful influx of higher temperatures. A pulse of warmth that likely pushed melt faster. Temperatures of 10-20 degrees Celsius became a common event near Hudson Bay and southern portions of the Canadian Archipelago. Above freezing temperatures stretched far northward, driving deep into the Beaufort Sea. 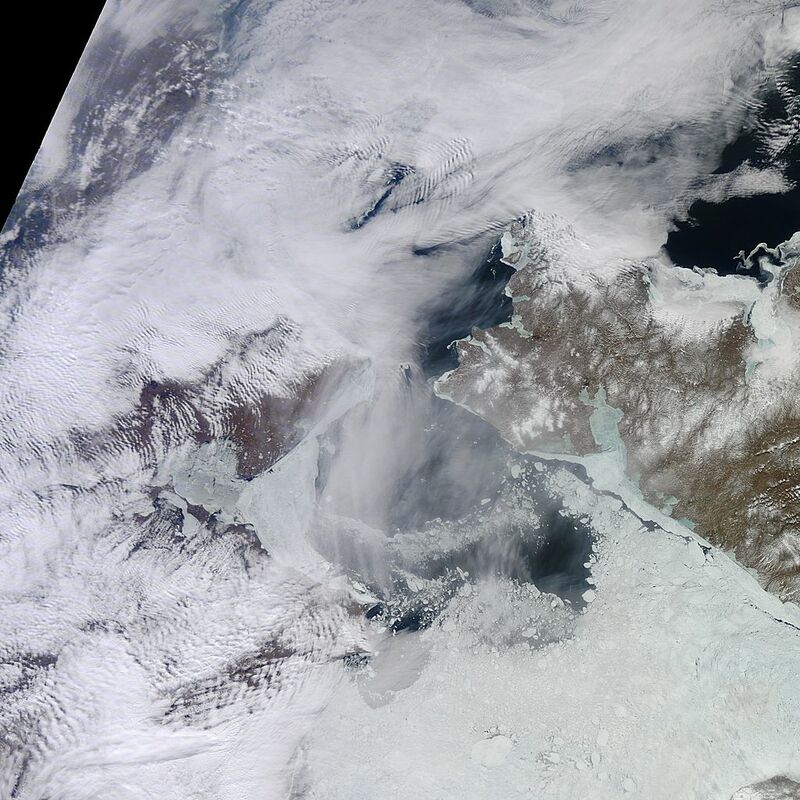 This is what Chukchi Sea ice looked like on the 2nd of June (Image source Lance-Modis). Note the clearing of most ice from the Bering Straight even as the ice edge retreated northward toward an increasingly fractured and thinned polar ice cap. As warmer air is expected to enter the Chukchi over coming days, it appears that conditions will continue to favor rapid edge melt there. Weather model forecasts also show warm air flooding into many regions at the ice edge, growing especially prominent in the Beaufort, Chukchi, and East Siberian Seas. Meanwhile, PAC 2013 is expected to continue to churn through the Central Arctic. These conditions are now projected to persist until at least June 20th, at which point our Persistent Arctic Cyclone will have lasted nearly a month. As noted above, this combination of conditions: warm air invasion at the ice edge, historically thin, fragile, and mobile sea ice, and a Persistent Arctic Cyclone (PAC 2013) are likely to continue to promote rapid to very rapid melt in the Arctic as June continues to advance. Though 200,000 kilometer per day sea ice area loss is extraordinarily rapid and dramatic, the potential exists for single day losses to exceed even this highly radical number. A sea ice cliff for June 2013, thus, appears to be a distinct potential. 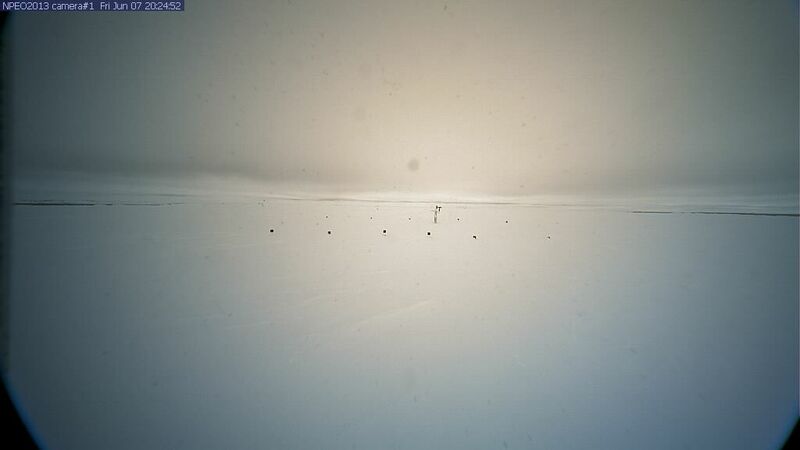 Small leads (cracks) in the sea ice became visible at the North Pole Observatory’s Camera 1 today. This camera is part of a North Pole environmental observatory supported by a National Science Foundation Grant and managed by the Applied Physics Lab at the University of Washington. Camera 1 is one of two cameras placed on ice at or near the North Pole to visually observe conditions there. The cracks began to appear at around 20:15 this evening when two areas of ice — one to the left of the camera and one to the right — began to break up. Ice near the North Pole is generally very stable. But melt over the past few years has begun to threaten melt in this region. Over the past two weeks, a persistent storm has churned up the ocean, breaking large sections of fragile ice. Unless conditions remain colder than average for much of the summer this year, large sections of ice, previously protected from melt, are at risk of loss during this summer. Some scientists, noting rapid trends in sea ice area and volume loss, have recently warned that Arctic sea ice could completely melt by end of summer as early as 2015 and possibly before 2020. An indication that this end stage melt was beginning would be cracking and break-up of ice in the area of the North Pole and in other protected regions close to Greenland and the Canadian Arctic Archipelago. Summer 2013 is not expected to see all or most sea ice lost by end of summer. However, an extraordinarily strong melt year with losses akin to 2007 or 2010 (volume) would be enough to render the Arctic mostly ice free. Today the Persistent Arctic Cyclone of 2013 (PAC), re-centered over the North Pole even as it wrapped itself in above-freezing temperatures. 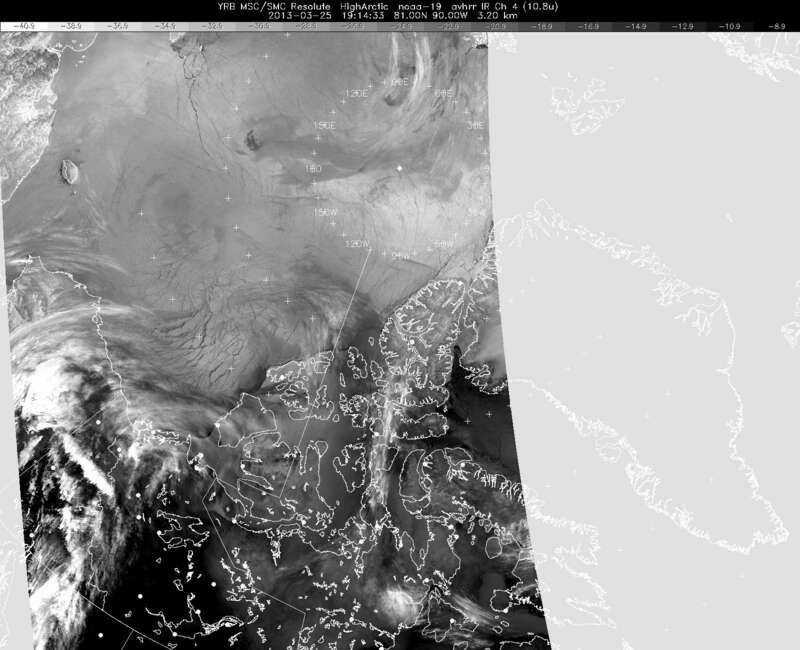 The above image shows a double barrel low roughly centered over the North Pole with a second low adjacent to the Canadian Arctic Archipelago. Lowest pressures remain around 980 mb — a rather potent storm for early June. Though not likely to grow as strong as the Great Arctic Cyclone of 2012 (GAC), this particular storm has now lasted for nearly two weeks and is projected to remain in the Arctic at least until June 15. Such persistence is likely to make this storm a substantial factor in the ongoing melt season. Yesterday, the storm drew warm air in from the south behind it. This influx of warmer air ran into the Central Arctic beneath a train of cloud over a region near Svalbard and was visible in this Lance-Modis satellite shot. Temperatures in the region of Svalbard rapidly warmed with some regions there reporting 50 degree temperatures today — a virtual heat-wave for Svalbard this time of year. An area of dispersed ice near Svalbard also suffered very rapid melt yesterday, likely a result of this flood of warm, moist air. This above-freezing air now resides over a region where sea ice remains broken and churned by previous passages of this storm. This region is heavily obscured by dense cloud cover. However, we can get a few peeks down through the clouds in the latest Lance-Modis shot of the region. What detailed inspection reveals is the ghostly image of shattered ice with large, dark gaps of ocean water between. These gaps have likely emerged through the physical process of storm winds diverging the ice as cyclonic forces churn the protective, cold top layer of water with warmer layers underneath. This assault from below is now enhanced by the fact that near freezing and above freezing air has moved in overhead (seawater melts at around 29 degrees Fahrenheit). The clouds in this image are quite thick. However, if you took slightly to the left of direct center, you’ll be able to see ghosts of the fragmented ice and large gaps beneath. The US Navy’s most recent CICE model run shows the PAC delivering a sustained blow to the thick ice just north of the Canadian Arctic Archipelago (CAA) before impacts are again projected to increase over coming days in the Central Arctic. Note the shifting of yellows and reds to greens and blues near the CAA. This is indicative of a loss of about a meter or more of sea ice thickness in this region. Also note the more wide-spread thinning that is expected to re-emerge near the North Pole as light blues in the model run fade more toward darker blues, showing about an additional half meter loss there. Confirmation will be necessary both visually and in other measures in order to verify the losses shown in CICE. Early losses were confirmed in Uni-Bremen, Lance-Modis visuals, and JAXA. However, dense cloud cover is currently making confirmation difficult even though some hints of this ongoing damage are visible through the clouds. As mentioned yesterday, the primary processes for melt occur through divergence of the sea ice as well as via churning, upwelling, and Ekman transport of warmer water up from the depths. Today, melt potential is added via near and above freezing air temperatures over large regions of the Central Arctic. And as we’ve been warning since last Friday, the sustained nature of this storm has the potential to severely weaken the Central Arctic ice just prior to the warmest days of summer. Since yesterday’s May PIOMAS update we’ve had more news to consider. However, apparent central ice impacts from this storm didn’t begin to seriously ramp up until the start of June. So we may need to wait to end of June for more clarity on total impacts. Nonetheless, all indications are this storm continues to fling the sea ice about quite a bit, with CICE continuing to show significant impacts to central ice thickness. So, for now, the big thin continues. Warm, moist air influx from the south appears to have provided this storm with some added intensity. What, earlier, was a double barrel low pressure system has now combined, drawing warmer air toward its center as its intensity increased to around 975 mb. Now this storm is just about 9 mb shy of the Great Arctic Cyclone of 2012’s maximum intensity. In any case, 975 mb is a very respectable storm. ECMWF weather forecast model runs for June 14 show PAC 2012 deepening to a 965 mb low pressure system. Should this strengthening occur, the system will have become stronger than the Great Arctic Cyclone of 2012. With the storm lasting so long, if it reaches such a strength, we may be dubbing it the Persistent Arctic Megastorm 2013 (PAM). 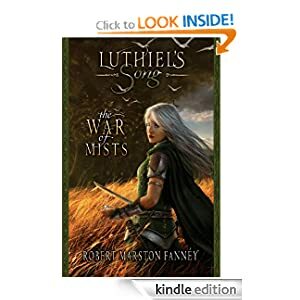 Definitely something to keep an eye on. A new study produced by polar researchers and published in the journal Science confirms a much warmer and mostly ice-free Arctic during periods when Earth’s atmospheric CO2 reached levels equivalent to those seen today. The study took sediment cores from Russia’s lake El’gygytgyn (pronounced El-Gee-Git-Kin) in order to determine climate conditions north of the Arctic Circle during a period around 3.6-2.2 million years ago. During this time, atmospheric CO2 levels were comparable to those witnessed today. So the study may well be a strong allegory for what we should expect if human CO2 levels remain near the dangerously high 400 PPM level. Lake El’gygytgyn was formed by an impact crater around 3.6 million years ago. It is a deep lake, so deep it would cover all but the top tip of the Washington Monument. For the first 20,000 years after its formation, there was little evidence of life found in sediment cores from the lake bottom. However, after this period, pollen from local plants began to emerge. Some, like Hemlock and Douglas Fir, tend to crop up in much more southern areas indicating that ice-free conditions predominated this extreme northern region. The researchers lead by Julie Brigham-Grette note that for such plants to be established in this region, temperatures would have been about 8 degrees Celsius hotter than today. These temperatures are consistent with a mostly ice-free Arctic environment. This research, along with a growing body of Paleoclimate science, indicates that climate is much more sensitive to CO2 increase than current climate models may suggest. Overall, Paleoclimate may well be a far better determiner of the end result of human fossil fuel emissions than models which seek to pin down extraordinarily complex processes and are still in the early stages of development. And if past climate indicators do prove to be the best guide, sustained CO2 levels above 400 PPM will push for a long term temperature increase of around 3-4 degrees Celsius globally and 8-10 degrees at the poles. 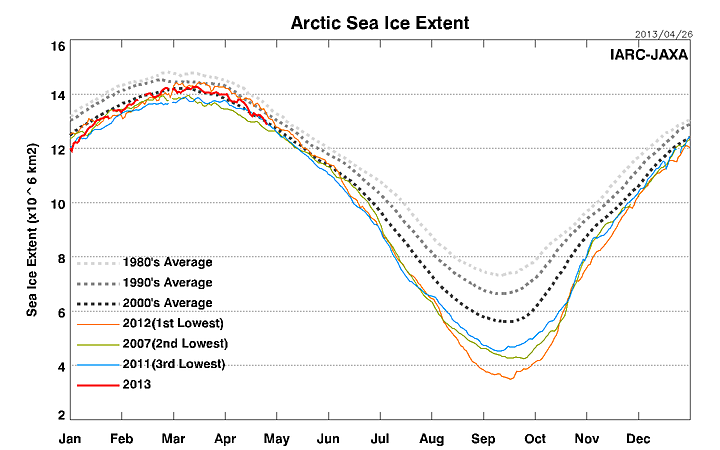 More importantly, these high levels appear to wipe out most ice in the Arctic environment. Such arguments aren’t merely academic. Ice loss in the Arctic is proceeding at a pace far exceeding previous predictions. Sea ice has melted by 80% since the early 1980s and rapid glacial melt is occurring in all regions of the Arctic. So we have past Paleoclimate evidence being validated by current Arctic trends which seem to point toward a far more rapid loss of polar ice than previously estimated. Even more concerning, perhaps, is the fact that the Arctic is responding to CO2 levels of about 2-3 decades ago when CO2 was closer to 350 ppm. Because of natural inertia, the current CO2 levels of 400 ppm won’t begin to have full impact on the Arctic for another 20 years or so. And, in light of recent findings, that is a rather chilling prospect. In the context of current business as usual fossil fuel emissions, these are substantial statements. If no additional warming is necessary to melt all the Arctic ice long-term, then what happens if CO2 levels increase to 1,000 PPM and temperatures rise to 6 degrees Celsius above average by the end of this Century? One can expect that under such extreme conditions, Arctic changes will be extraordinarily rapid and chaotic. Despite an ongoing and precipitous trend of sea ice loss, it still happens now and then. As cold air invades and re-freeze sets in, pace of new ice formation spikes and we get the potential for a bit of ‘recovery’ in sea ice area and extent by March-April following record summer losses. The trend for sea ice area and extent for these months is still down, however. According to NSIDC, extent is falling at a pace of about 2.5% per decade during March and April. This pace of loss is quite modest when compared to summer losses, even though the long-term trend is still down. There is, however, one small wrinkle in this observation. Winter sea ice volume measurements have tended to cluster in a given range before taking large steps down during certain years. Summer, on the other hand, has shown more steady and consistent melt with large step years spaced out by many years of more moderate melt. So it was little surprise when sea ice volume tied and slightly exceeded March 2011 and 2012 measurements for brief periods during the winter of 2013, edging above the record low value by about 70 cubic kilometers on certain days. 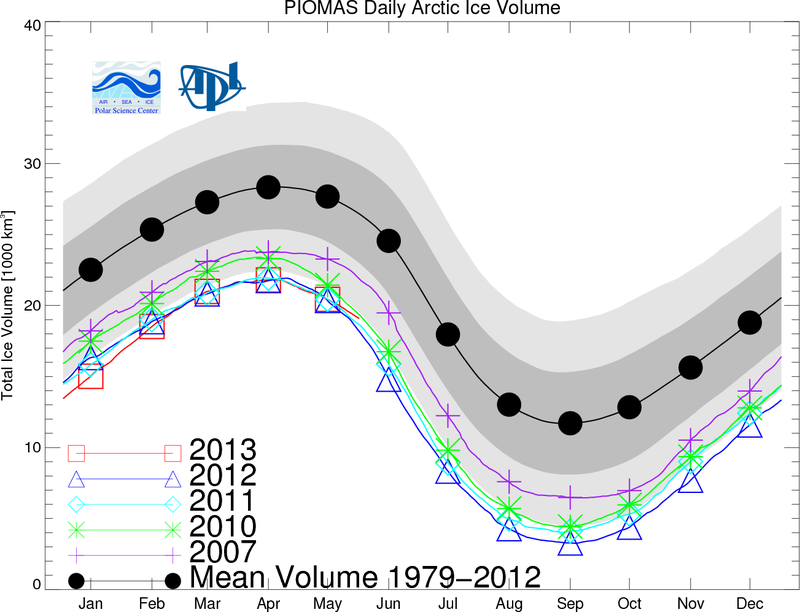 Now, PIOMAS shows pace of volume melt rapidly increasing through mid April. And this new melt has brought Arctic sea ice volume back into record low territory, edging about 80 cubic kilometers below the record set in 2011 for that time. Sea ice volume is the critical measure now that validation from satellite instruments has clarified the accuracy of PIOMAS modeling. Area and extent only measure the surface as visible from above. 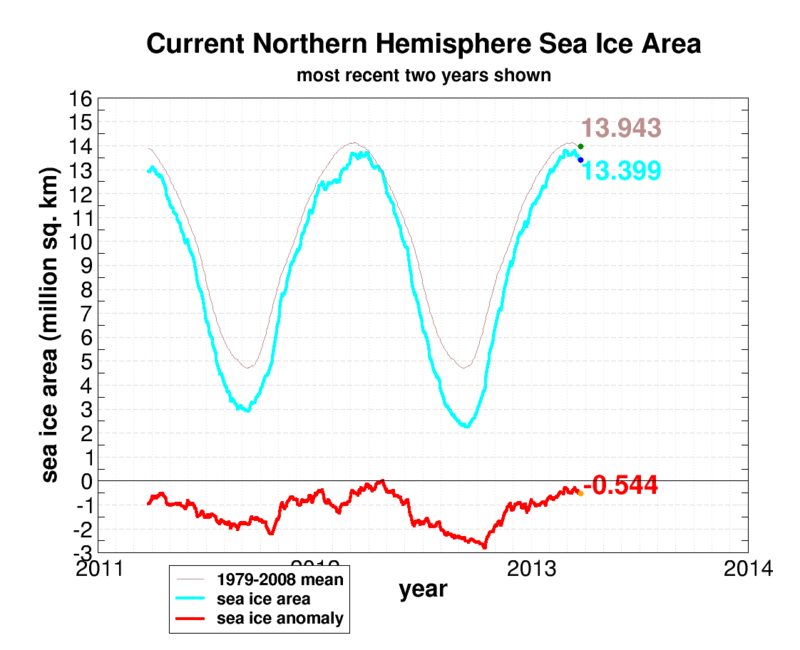 But the total proportion of remaining ice is captured by current volume measurements. And what PIOMAS is showing, at this point, is that sea ice volume in the Arctic is currently lower than it has ever been in modern reckoning. The most recent updates from the Japanese Space Agency (JAXA) and Uni Bremen show Arctic sea ice extent in very rapid early season decline. The above graph, produced by Uni Bremen, shows a stunning loss of sea ice extent over the past week of more than 1 million square kilometers. Such extent losses are almost unheard of for this time of year, with retraction, at least according to Uni Bremen, even out-pacing what is usual for July and August. Though neither as extensive nor as sudden as Uni-Bremen losses, the JAXA graph does show a rapid decline of about 500,000 square kilometers over the past week. NSIDC and DMI, on the other hand, show declines to be much more gradual. The NSIDC area measurement also is currently showing a much more gradual decline. As noted above, the discrepancy between these measures should wash out over the next week. But early indications from JAXA and Uni-Bremen are some cause for concern. Arctic conditions in context show warmer than average air temperatures remaining over much of the region. These departures from normal high and low temperatures are not as great as they were a week ago. However, these warmer than normal air temperatures are also now riding on top of a seasonal increase and so more rapidly push the Arctic toward melting. 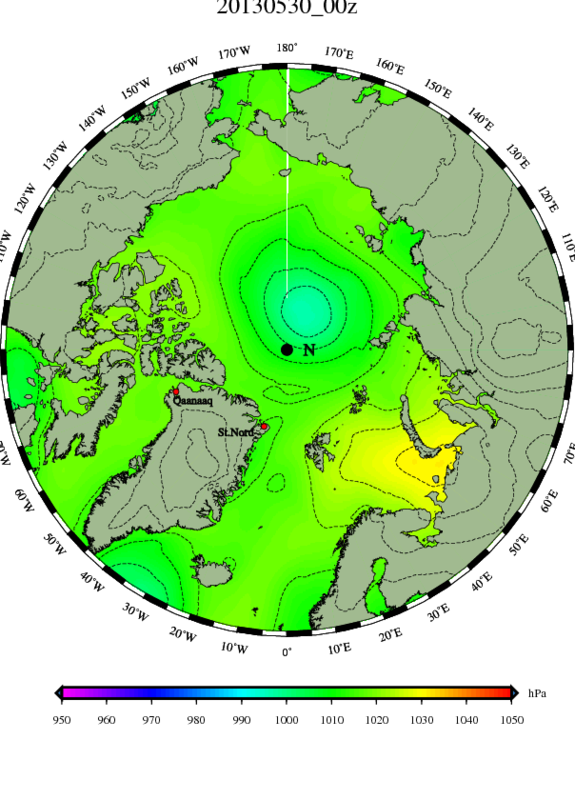 Warmer than average water temperatures also continue to pervade over most of the Arctic Ocean. Recent reports have confirmed sporadic warm water upwelling throughout the Arctic. These events contribute to bottom melt and cracking of sea ice and are just one more mechanism pushing the Arctic sea ice into decline. Such warm water upwelling is likely linked to a rapid increase in ocean heat content. A portion of this newly sequestered heat energy appears to already have done quite a bit of work in reducing Arctic sea ice extent, area and volume. One such upwelling event occurred off Barrow Alaska in March of 2013. The event combined with off-shore winds to result in ice free waters for a short time off Barrow, one of the consistently coldest locations in the Northern hemisphere, in winter time. Such events have been known to occur. But the up-welling and wind driven melt this March was one of the largest such winter-time events yet witnessed and it coincided with an immense sea ice cracking event. Overall, we see warm air temperatures over Eastern Europe and Russia rapidly expanding northward with above freezing temperatures crossing the Arctic Circle in some areas. Even Siberia is seeing rapidly warming temperatures. Cooler air remains settled in over Greenland and the Canadian Arctic Archipelago (CAA). These conditions are somewhat the reverse of those seen earlier in the month when Greenland and Baffin Bay showed warmer temperatures while Europe and Russia shivered. As the Arctic continues to warm, we are likely to see sea ice melt continue at a slow to moderate pace. That said, an increasing number of indicators show the potential (low to moderate) for a major pick-up in early season melt rates come late April/early May. Should these events emerge, the upshot would be the possible start to a summer of massive Arctic melt. A melt that would be the pre-cursor or possibly even the start of a new period of ice-free or near ice-free summers. It is still too soon to make this call. That said, it is possible we are seeing some foreshadowing in the Uni-Bremen and JAXA measures showing very rapid extent losses over the past week. As a final note, it important to re-iterate that the Arctic sea ice remains extraordinarily thin, fractured and fragile for this time of year with continued rumblings that melt may begin to proceed rapidly and well ahead of schedule. Uni-Bremen has just posted a revised estimate of sea ice extent. This revision shows melt occurring at a somewhat more gradual pace. You can view the revised data here. JAXA estimates, however, remain the same as previously posted. In a recent press release, NOAA has revised its predictions for an ice-free or nearly ice free Arctic Ocean. The statement publicizes work by two scientists, James Overland and Muyin Wang who have now incorporated three methods of determining when an ice free or nearly ice free Arctic is most likely to manifest. Their work recently published in Geophysical Research Letters and is available there. 1. A trends analysis that predicts nearly ice free conditions by around 2020. This analysis takes into account past average rates of sea ice loss and extrapolates it forward in time. The analysis Wang and Overland put together establish a nearly ice free state by 2020. 2. A stochastic approach that incorporates a higher natural variability with large, somewhat random, melt events resulting in a near ice-free state by or before 2030. 3. A model approach which still shows nearly ice free summers occurring during a period between 2040 to 2080. Wang and Overland note that the model predictions are likely to be much slower than actual melt. That said, they defended the models saying it was necessary to continue their development in order to better understand the Arctic climate. Overall, this represents a rapid shift on the part of NOAA. Past official estimates were for near ice free conditions being most likely after the first half of the 21rst century. But with rapid melt trends pushing for a much sooner melt date, NOAA has adjusted its forecast. Given this most recent paper, Wang and Overland seem to indicate a most likely near ice free state in a time period of 2020-2050. It is my opinion that the range NOAA gives of between 2020 to 2050, with caveats that model predictions are likely to be too slow, is still a bit too conservative in that it fails to give warning to the rising risk of an almost immediate melt. Just following current melt trends brings us to a completely ice-free Arctic by 2017. Any single melt year like 2007 or 2010 (volume) brings us to an ice free or nearly ice free state in one year. Perhaps NOAA could add another set of circumstances to its analysis — the exponential melt trend analysis. Such a trend would incorporate the risk of a near immediate melt, warn the public and governments of the potential for such an event and give NOAA a more realistic near ice free range of 2015-2050. In doing this, NOAA would acknowledge the potential for an ice-free or nearly ice-free state within the current decade. This acknowledgement is important from the standpoint of emergency preparedness. An ice free Arctic and the likely climate mayhem it would produce is not something we generally want to remain unaware of. 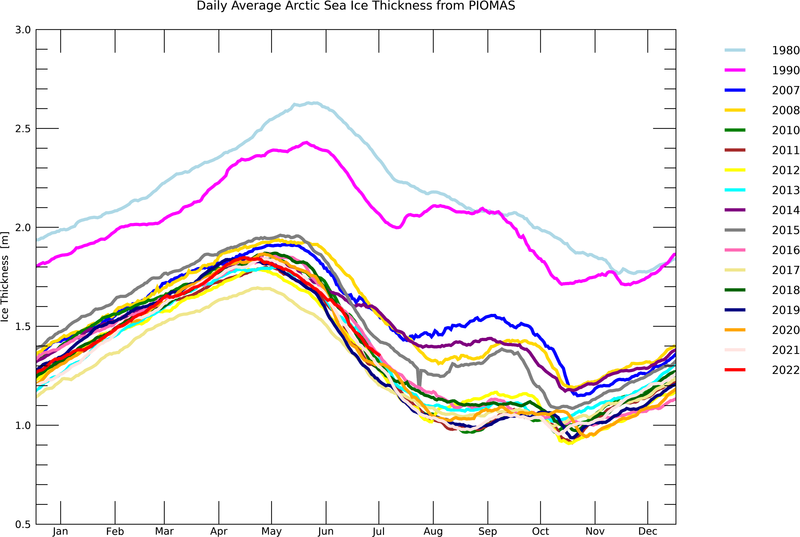 Risk assessment forecasts provided at this blog and incorporating sea ice volume data from PIOMAS show a 10% chance of an ice free or nearly ice free state this year, with a high risk (60% chance) of an ice free state by 2017. Some polar experts like Peter Wadhams believe that the Arctic will reach an ice-free state as soon as 2015-2016. Wadhams has spent thousands of hours researching the ice aboard navy submarines. So if there’s someone who knows sea ice, it’s Wadhams. While negative feedbacks that slow the loss of sea ice may emerge, any prediction for a near ice free state after 2020 hangs its hopes on those, yet to emerge, melt inhibitors. More likely, the reduced resilience of the ice will compound with a warming climate to push melt to occur with a bang and not a long, drawn-out whimper. Further, the fact that the ocean upon which the ice rests is collecting a greater volume of human produced warming is likely to enhance bottom melt regardless of atmospheric temperatures, even in winter time. We can see this in the catastrophic volume losses observed even during the coldest months with current peak volumes comparable to those of the warmer months during the 1980s. If current volume trends bear out, we see ice free winter states by 2040. Something neither the models, nor NOAA have on their public radar. What is happening in the Arctic currently constitutes the beginning of a global climate and weather emergency. The UK Met recently called an emergency meeting due to a rapid shifting in the UK climate as a result of catastrophic sea ice melt. Such emergency sessions are likely to become more common as time goes forward. NOAA’s movement on this matter does represent an increased alertness to the scope of the problem and should be applauded. The work of their scientists and modelers has enabled a greater understanding of the Arctic than ever before. However, for scientists to remain on the cutting edge, they will have to adjust to events far more rapidly than in the past. They will also need to begin to acknowledge the potential for dangerous outlier events. The current NOAA statement strikes a balance between the traditional conservatism of science and the need to acknowledge an Arctic undergoing catastrophic change far more rapidly than anyone expected. Thus, it represents progress. That said, if current trends bear out, these still somewhat conservative predictions of near ice free conditions via NOAA may soon be moot. The Collapse of Arctic Sea Ice: Will Beaufort Break-up and Melt Proceed a Month or More Ahead of Schedule? The scientists are worried. The Arctic is responding to human-caused climate change much faster than expected. As little as a year ago, scientists weren’t predicting an ice free summer Arctic Ocean until around 2060 to 2080. Then the 2012 melt season erased all hope that melt would proceed at such a gradual pace. Now, most scientists predict that summers will see an ice-free Arctic Ocean by 2030. Unfortunately even this, much earlier, date may be too conservative for the Arctic sea ice, which appears to currently be shattering under a death blow of global proportion. And it is, for this reason, why we should seriously listen to one scientist who has spent much of his career listening to the sea ice. This collapse I predicted would occur in 2015-16 at which time the summer Arctic (August to September) would become ice-free. The final collapse towards that state is now happening and will probably be complete by those dates. Wadhams’ prediction comes very close to fitting the current trend of sea ice volume losses which will result, if trends continue, in an ice free Arctic come summer by 2017. However, as noted in a previous analysis here, any single melt year comparable to 2007 or 2011 would be enough to take down all or most of the remaining sea ice in just one year. So the critical question is this: is such an event occurring now? Are we experiencing the final collapse that Wadhams mentions? If so, how would we know? Given that we have no precedent for what is happening to the sea ice, it is far more difficult to predict what may happen than, say, in a weather forecast. Regardless, there may well be a number of clues that are showing us a very big melt season and, with it, the last days of Arctic sea ice is well on the way. 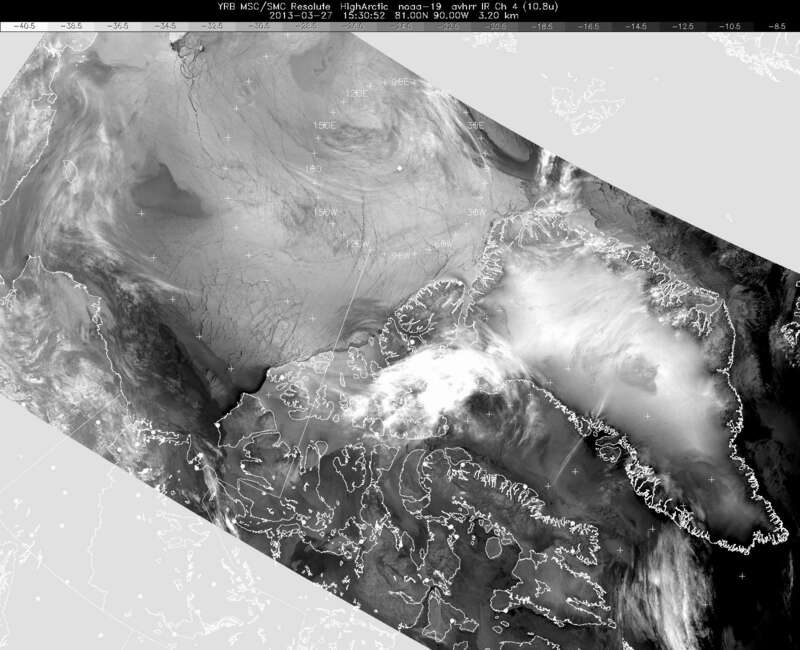 Enter the Beaufort sea ice. The Beaufort sea contains ice that protects the rear of the remaining thick ice. Beaufort ice acts as both wall and insulator to the dwindling last bastion of multi-year ice now huddled protectively next to Greenland and the Canadian Arctic Archipelago. Should that protection disappear too rapidly or too early, much of that remaining ice may not be able to make it through the Arctic summer. Unfortunately, Beaufort sea ice underwent a major cracking event from February to March. Such events usually don’t occur until April or May. But this year’s cracking event came 40-50 days sooner. It also came with a vengeance. The cracks, usually contained within the Beaufort Sea, spread to cover much of the Arctic, invading even the remaining thick, multi-year ice. Not only did this cracking event rupture the thick ice, it also appears to have taken it off its anchor point. This combined impact is likely to leave the multi-year ice both more fragmented and mobile come summer. And it could spell disaster for the remaining sea ice. What you are seeing in the above image is a break up of sea ice that occurred from March 30th to June 15th of 2012. This event bears striking similarities to this year’s February break-up. It contains the same network of ring fractures and it resulted in radically reduced resilience of Beaufort sea ice come mid-summer. The difference is that last year’s break-up began about 45 days later and was much smaller. It did not include the thick sea ice, nor did it pull that ice from its anchor points. This year’s break-up did both. Comparing 2012 visible imagery to 2013 infrared is somewhat problematic but the best match to today’s date 05 Apr 13 is approximately 10 May 12, or 35 days later. The southern coastline in the vicinity of Banks Island provides the best diagnostic region. Recall 2012 was a record melt year with a very similar arc fracturing pattern developing in the Beaufort. However this developed much later in the spring and did not extend past the Prince Patrick Island leverage point. 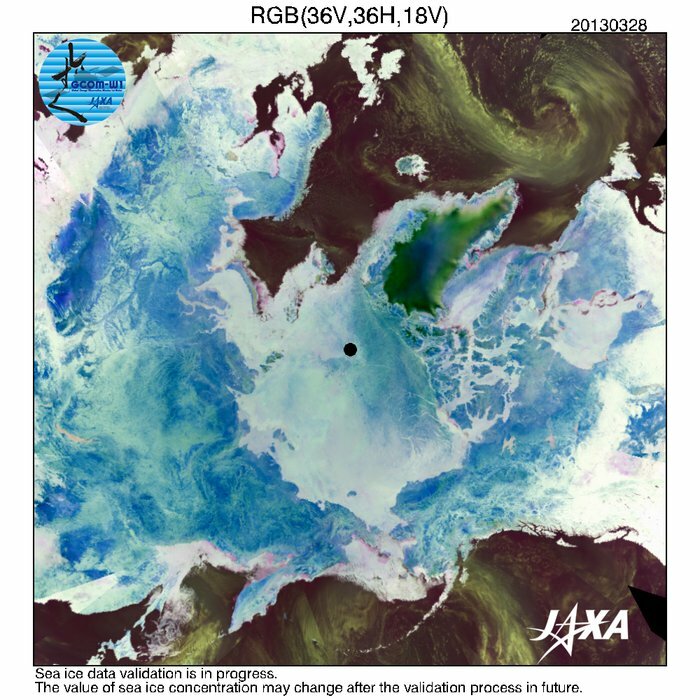 In summary, the rapid acceleration of Beaufort Gyre rotation in early June 2012 and the breakup of icepack into floes can be expected in early May for 2013. This will contribute to a vastly more extensive melt-out expected in late summer 2013. So what is setting up to happen next, should this worst case estimate proceed, is that the Beaufort Gyre will rapidly accelerate come early May, resulting in a disintegration of sea ice similar to what is seen in the above picture, but about 30-40 days ahead of schedule. The Gyre is a surface current that circles the Beaufort Sea. Ice on the water tends to retard the flow of this current. But as the ice becomes less solid, the Gyre speeds up, aiding in the breaking and mixing of sea ice with warmer waters. This process, as seen in the image sequences above, can lead to a rapid collapse and melt-out of sea ice. If such an event does occur at such an early date, it will be one more indication that summer 2013 melt is proceeding at a much faster and more dangerous pace than even 2012. The early break-up was a strong indication that melt may be much worse for this year. 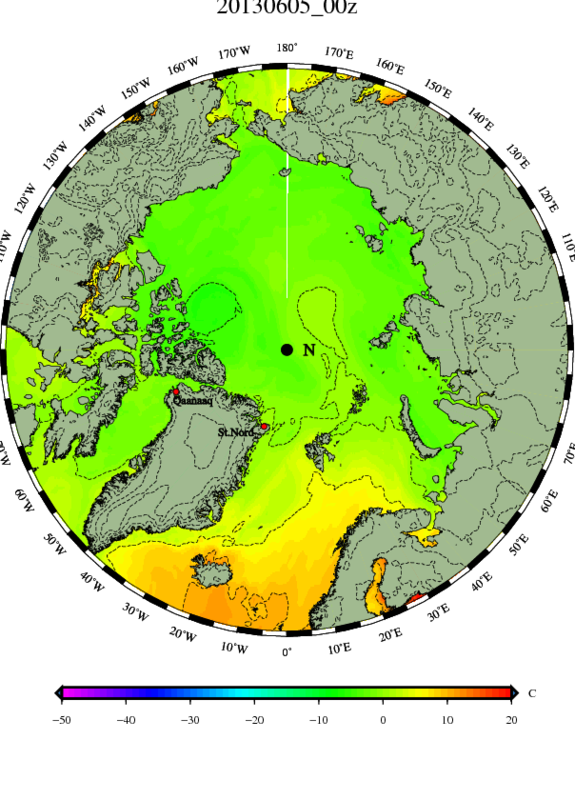 If an early melt and speed up of the Beaufort Gyre occurs in this region, it will be one more sign that the summer of 2013 could be one in which further dramatic and dangerous melt occurs. One which may spell out the last days of Arctic sea ice. Overall, worldwide sea ice totals have been declining over the past few decades. This trend has been led by a massive summer collapse of sea ice in the Arctic. But, on the other side of the world, in Antarctica, sea ice area and extent have been slowly expanding. This seeming contradiction recently spurred researchers to take a closer look at Antarctica to determine why sea ice would be expanding even though worldwide atmospheric and ocean temperatures are on the rise. What they found was an amazing and complex combination of forces driving a moderate sea ice expansion in the southern hemisphere. Warmer waters coming into contact with submerged glaciers slowly melts the ice. In addition, a warming Antarctic continent disgorges large volumes of water each year. This fresh melt water, flushing into the ocean at a rate of 250 gigatons each year, then expands, covering the ocean surface in a thin layer surrounding Antarctica. Not only does this fresher water freeze at higher temperatures, it keeps warmer waters from rising up to melt the sea ice from below. The result is that sea ice is both insulated and made of fresher water. So until atmospheric and ocean temperatures rise enough to overwhelm this dynamic, Antarctic sea ice will remain protected by insulating processes coming from melting glaciers. Warmer water trapped in the ocean depths surrounding Antarctica has also played a role in heating the world’s deep oceans. This heating was recently detected in a new study conducted by Kevin Trenberth and colleagues. The study found that a significant portion of the last decade’s heating had been sequestered in the deep ocean. 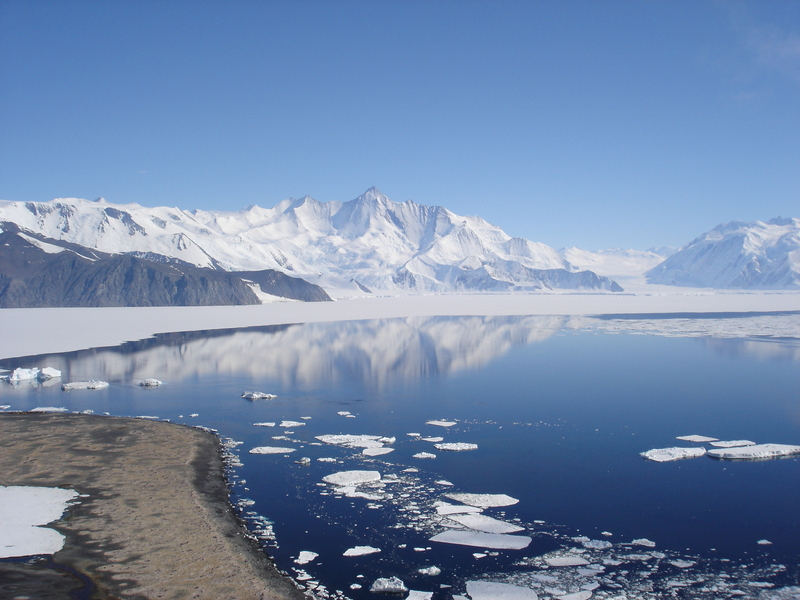 Now it’s apparent that glacial melt in Antarctica may have played a role. 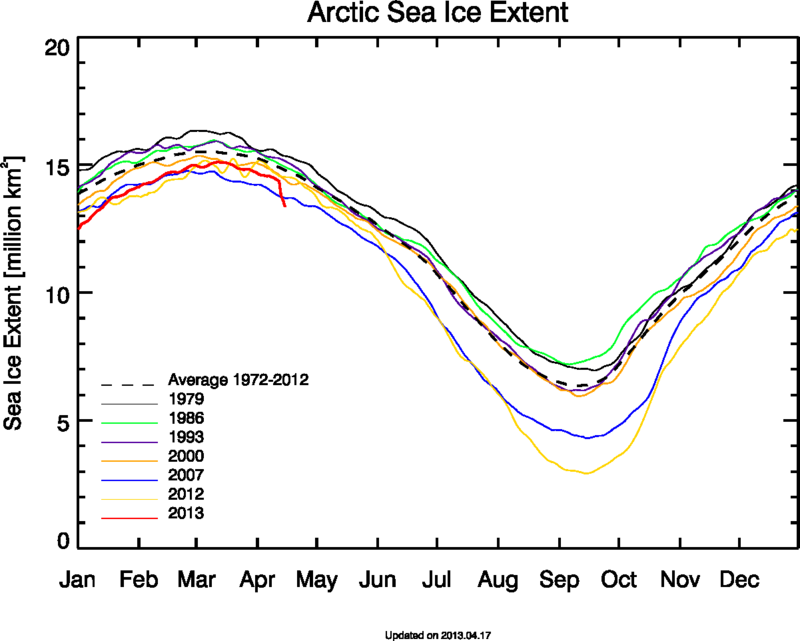 The Arctic sea ice, thus far, hasn’t benefited from a similar insulating process. The result was an 80 percent sea ice volume loss since 1979 and a high risk that sea ice will completely melt one summer between now and 2020. It’s possible that Greenland melt may continue to increase, freshening the Arctic’s waters, and providing a similar benefit at the cost of enhanced sea level rise and more extreme weather. But ocean currents, geography, and salinity dynamics for the Arctic are different from that of the Antarctic. So it is uncertain if melt will play as large a role in insulating northern hemisphere sea ice as it has in the southern hemisphere. It is worth noting that rapid glacial melt, though it drives more extreme weather events even as it more rapidly increases sea level, tends to put a powerful damper on global temperature increases once glacial melt reaches the 1 meter mark. The heat energy goes more into melting the ice and less into warming the atmosphere and oceans. The negative feedback of fresher ocean waters in the polar regions as well as iceburgs floating in rapid glacial melt zones also has a net cooling effect. The result is that a degree or more of global temperature increases may be ‘held in check’ as the ice melts. Rapid ice melt decades may result in brief periods of relative cooling (where temperature increases back off from 1.5 or 2 degrees above average to around .9 to 1.3 degrees above average). 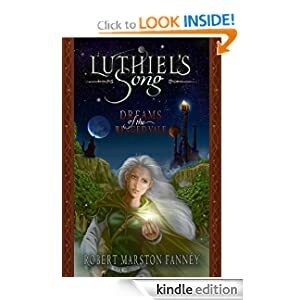 It’s a balancing effect and trade-off where you end up with more changes to the Earth’s environment and less overall heating in the short-term. This delayed heating effect of ice melt should not be seen as a good sign, however. As mentioned above, it comes at the severe cost of increased weather extremes and more rapid ocean level increases. In the end, once the messy transition decades are passed, a more liquid ocean results in more water vapor in the atmosphere, warmer Arctic and Antarctic environments that pump more greenhouse gasses into the atmosphere, receding glaciers and snow cover reducing the Earth’s reflectivity and adding further warming, and a warmer deep ocean resulting in more ocean methane release. It is worth noting that the scenarios examined in the paper come as a result of a relatively moderate increase in human greenhouse gas emissions: the A1B scenario. However, current emissions have increased more along the A1FI scenario which would likely result in even more climate volatility than the Hansen paper suggests. The thing to take away from this new study is that both the Arctic sea ice collapse and the slower expansion of Antarctic sea ice are caused by the same forcing — human caused global warming — and that the glacial melt now resulting in localized cooling is also driving enhanced sea level rise and more extreme weather. 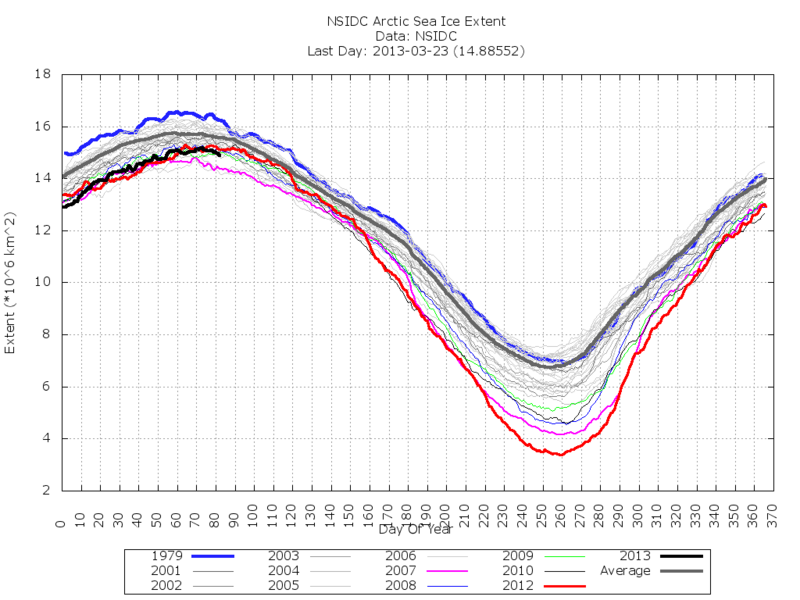 A major early season Arctic sea ice cracking event has mostly run its course. 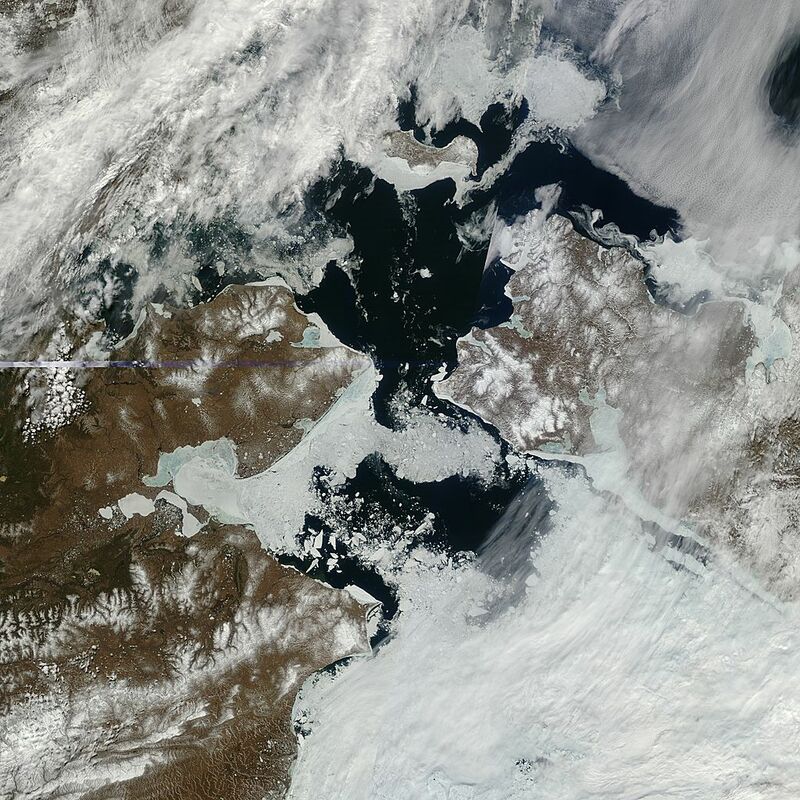 This unprecedented and much sooner than usual ice break-up left scars all over the Arctic. Scars that are likely to leave the ice in a much weaker condition as the current melt season ramps up. The most obvious are visible as cracks and leads through even the thickest ice. But equally concerning is a very rapid transport of thick ice out of the Fram Straight over the past few weeks. Export of ice through Fram is usual, regardless of season. What is unusual is that this particular event occurred with such high velocity that it rapidly depleted a large region of the Arctic’s remaining thick ice. The acceleration of sea ice motion during the recent cracking event pushed enormous sections of ice to the north of Greenland, ice that had previously been part of the swiftly dwindling multi-year ice pack, out into the North Atlantic where it is destined to collide with warm ocean currents and melt out. Looking at an animation of sea ice since mid-February, it looks as if the thick ice is being squeezed out of the Arctic like toothpaste is squeezed out of its tube. Multi-year ice (MYI) has been in rapid decline ever since the year 2000 and is now at lowest levels in any historic record. This ice is also the Arctic’s thickest, its freshest and its most resilient to melting. MYI decline, cracking and rapid export through the Fram Straight is leaving it more and more weakened for the upcoming melt season. This depleted state, combined with the fact that most of the remaining Arctic is now covered in first and second year ice means that the sea ice will be far more vulnerable to weather, wind, waves, sunlight and heat come summer. It is the year after year decay of the thick, multi-year ice that is just one factor making ice ever more vulnerable. Ever increasing ocean heat content, decreasing spring snow cover, loss of Arctic reflectivity or albedo, increasing expanses of dark, sunlight and heat absorbing water, increasing Arctic greenhouse gas feedbacks, changes in the water column due to methane hydrate destabilization, and ever-increasing human greenhouse gas emissions are all factors pushing the Arctic toward more rapid transition. The drama appears to have mostly subsided for now. An unprecedented cracking event that began in February and expanded through mid-March seems to have mostly paused. Brief openings revealing open water have mostly frozen over with thinner ice. This is not to say that the Arctic is entirely quiet. 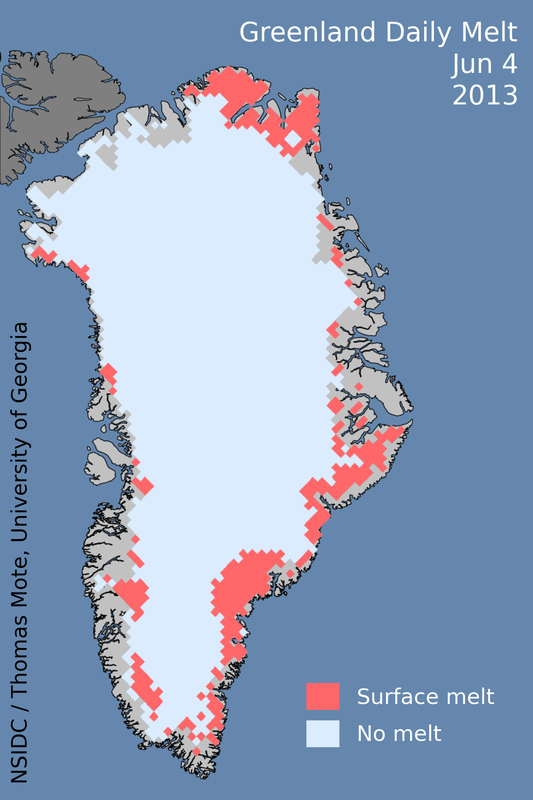 Thick ice has continued to lift away from the CAA and Greenland, resulting in a spreading and thinning of ice in these regions. Ice shows rapid movement out the Fram Straight. Tantalizing hints of new cracks emerge. And a slow melt proceeds. Cryosphere Today shows sea ice area dropping slowly to about 380,000 square kilometers below sea ice maximum. The current measure, 13.399 million square kilometers is the seventh lowest on record for this date and somewhat lower than the 2012 measure for today. The smoothed NSIDC graph shows decline continuing in sea ice extent, with measurements of around 14.9 million square kilometers. This measure is now outside the -2 standard deviation range and shows continued slow decline. Sea ice extent has been hovering around 5th lowest on record for the past few days. Major crack expansion seen in February and early March has abated over the past week. However, some features of interest do appear on recent satellite shots. A series of fissures can now be seen traversing the thick ice in a crescent moon pattern west of the North Pole and running up from Greenland and the CAA. These appear somewhat more pronounced than yesterday, though enhanced clarity may be from a better satellite shot. In any case, these fissures as well as the Beaufort cracks will bear watching over the coming days and weeks as spring season melt intensifies. Overall temperatures for the Arctic remain above average with warmer than normal temperatures concentrating around Greenland, Baffin Bay, and the Canadian Arctic Archipelago (CAA). A pool of above average temperatures also remains north of Siberia. Weather maps show high pressure continuing to dominate the central Arctic with a series of weak to moderate low pressure systems skirting the area of this high in the Bering, Northern Canada, and South of Svalbard. A strong low (970mb~) approaches Greenland, Iceland and England from the North Atlantic. Though the central Arctic high still dominates, negative Arctic Oscillation values have fallen to around -3.8 from a peak of about -5.5 more than a week ago. Negative AO values are forecast to shift closer to zero come early April. Overall, higher than average temps, what appears to be still fragile ice, still rapid ice mobility, and weather systems whittling away at the ice edge would still seem to favor slow ice melt over the next week. That said, we may experience a small bump in sea ice values as somewhat colder air briefly over-rides the current melting trend. Generally, though, seasonal forcing would tend to combine with the above factors to push for continued gradual melt. Arctic sea ice melt continued over the past two days with both NSIDC and Cryosphere Today showing continued lower area and extent values. 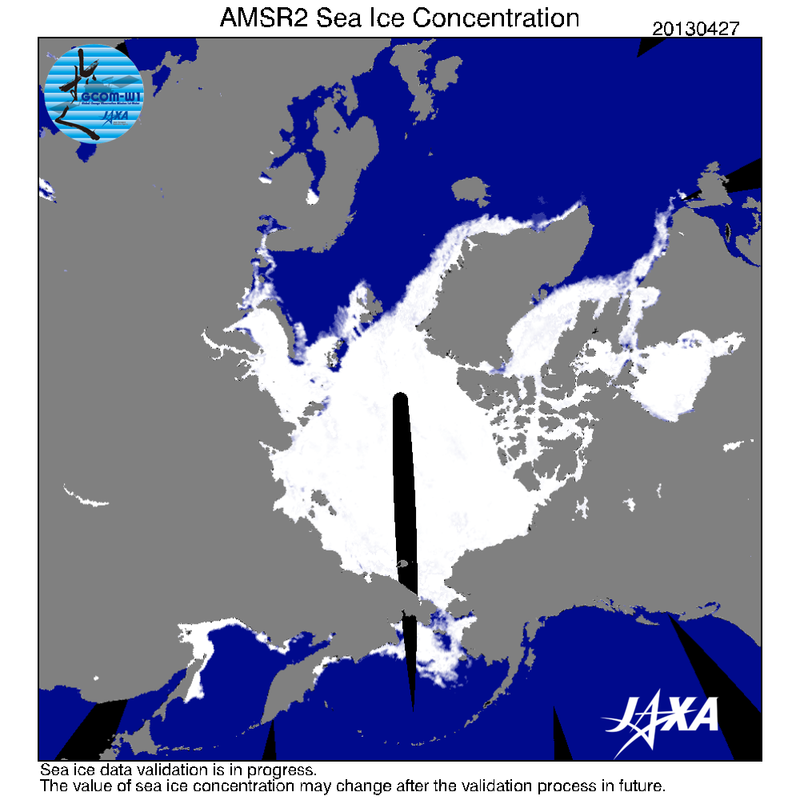 The Japanese Space Agency sea ice monitor (JAXA), showed slightly higher extent values but didn’t buck the overall melt trend. Overall, sea ice area measures are about 370,000 square kilometers below maximum. So a melt trend is pretty well established as the 500,000 square kilometer threshold approaches. A very large cracking event that is unprecedented for its size so early in the season seemed to pause this weekend. That said, cracks did continue to appear in somewhat unlikely places. 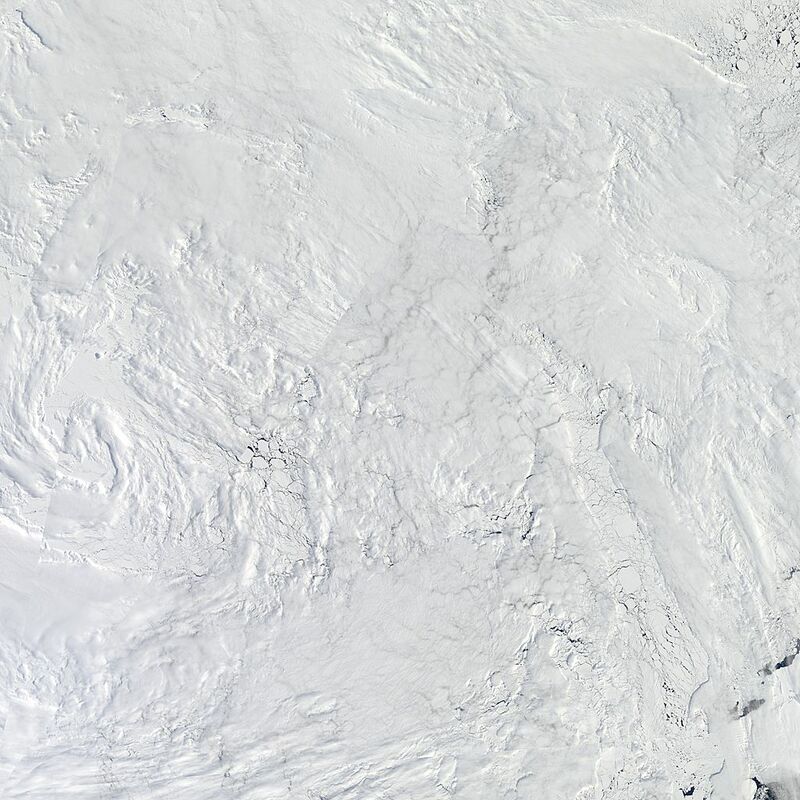 Poster Espen over at the Arctic Ice Blog pointed out a series of cracks from a NASA shot of Lancaster Sound. Located in the Canadian Arctic Archipelago, Lancaster Sound is a part of the network of seaways that make up the Northwest Passage. Early breakage in this region may, but does not conclusively, point toward an early opening of the Northwest Passage for this year. Will have to keep an eye on events as new conditions emerge. For an excellent overview of this major ongoing cracking event, take a look at this article written by Neven and re-posted both in Skeptical Science and Climate Progress. The extraordinarily powerful high pressure system contributing to a strong negative Arctic Oscillation (AO) has diffused into a larger ridge stretching from northern Russia to Baffin Bay. Pressures within the ridge have been slowly falling. As a result, negative AO phase has weakened somewhat, falling to a value of negative 4.5. 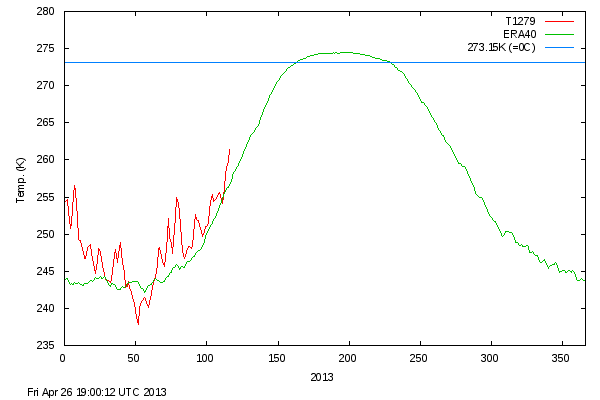 The Arctic has also cooled a little from earlier high temperatures. That said, temperatures remain above average for this time of year. All that said, the overall blocking pattern transporting heat into the Arctic over Greenland and Eastern Siberia appears to remain intact. Further, the polar jet stream is very wavy, with lots of warm air intrusions from the south and cold air influxes from the north. Looking at weather models covering the next 10 days, this waviness in the jet stream appears to intensify as spring continues to emerge. This pattern is likely to drive warm air repeatedly into the Arctic’s heart while forcing colder air out and onto the continents. 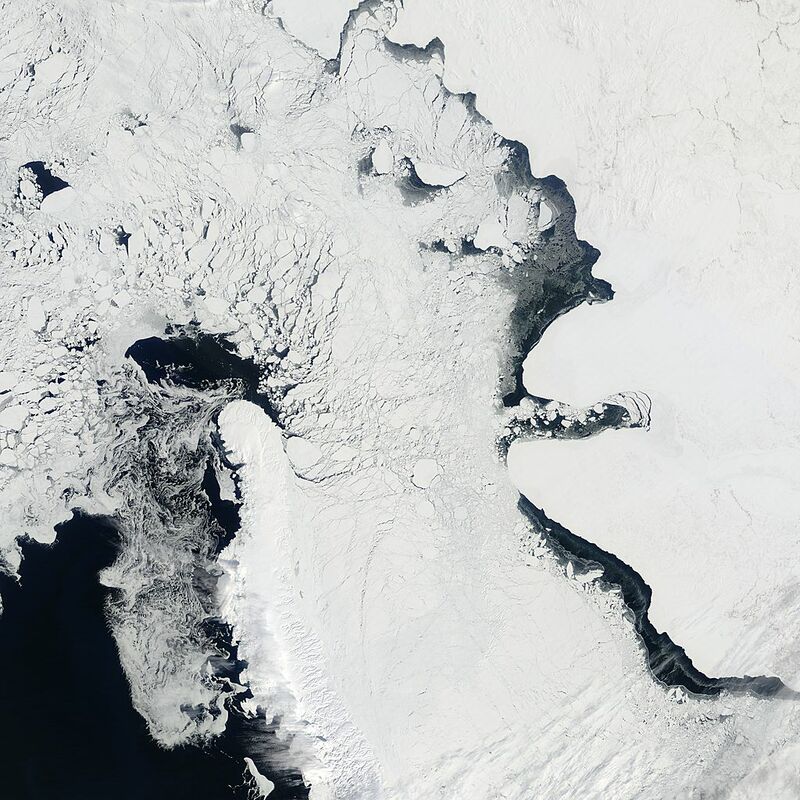 A low pressure system forming just east of Kamchatka disrupted thin sea ice in the region. This energetic low swirled the ice to such an extent that its effect was visible on the Navy sea ice thickness composite below. This mixing led to some loss of sea ice in the region. According to ECMWF model forecasts, the low is expected to strengthen and move toward the Barents Sea over the next couple of days. So areas of Barents sea ice may also see disruption as the low deepens and churn through the region. Later, another low is set to emerge again over The Sea of Okhotsk. Overall, melt appears to be eroding ice in Baffin Bay (likely due to warmer than average conditions), in the region of The Sea of Okhotsk (storminess appears to be playing a role here), and in the fast ice just east of Greenland and on the south side of Svalbard. Spreading areas of thinner ice continue to emerge or remain north of Barrow Alaska and Northern Canada. A large fissure between the Canadian Arctic Archipelago and the thick ice that usually anchors there this time time of year continues to stress and disrupt the multi-year ice. Weather conditions, though slightly less favorable than a couple of days ago, would seem to still contribute melt on the back of an over-all slow warming, erosion of the ice edge, record thin ice values, and a slow increase in sunlight typical for this time of year. I’ll leave you with this image from the Canadian Weather Office. As you can see, some of the leads from this past month’s cracking event appear to have snowed over a bit. A view that appears serene and calm, for now.